I was inspired by the perseverance of this wonderful maple that fills the urban space. This particular angle emphasizes the viewpoint of a passerby, distracted from the odd conglomeration of urban details and the path and traffic ahead. For the current tree series I found it different to go out looking for trees to be the focus of the painting – rather than looking for interesting abstract patterns of light and color that create the space and an interesting painting. I started looking for “characters” that redefined a space, that stood out as individuals. This one, on Clinton Street not far from Church Street, has no trees or buildings around it, so it is free to spread out. What an insurance agent might see as a dangerously precarious limb, I see as a dynamic subject. I started on an early spring day, then it snowed and I had to wait for the warmth to return. 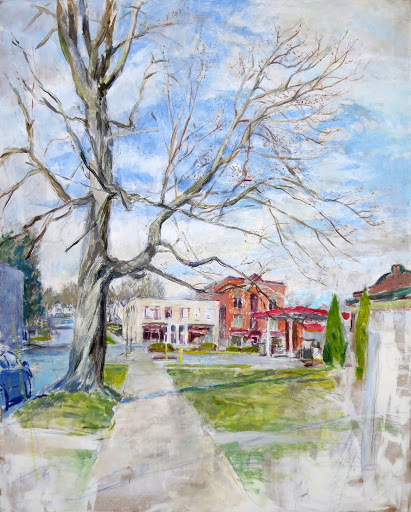 As I painted I enjoyed talking with the passing people, some of whom had already admired the tree, and others who were looking at it for the first time, through my eyes. This is a work from the spring, showing the version as it was in progress. I began it because I really liked the old maple with the one very long limb reaching out into the space. I am often interested in what could be called an “anti-picturesque” scene – that causes me and any viewer to reconsider what is interesting to look at. This is just an ordinary street, with a gas station and with some nondescript buildings amidst some more historically interesting ones. But the way the tree fills the space and the light passes through, it all comes alive. A friend remarked about both the tree and this view of it – that the landscape as been “saved” by the tree – bringing life to a rather barren urban location.